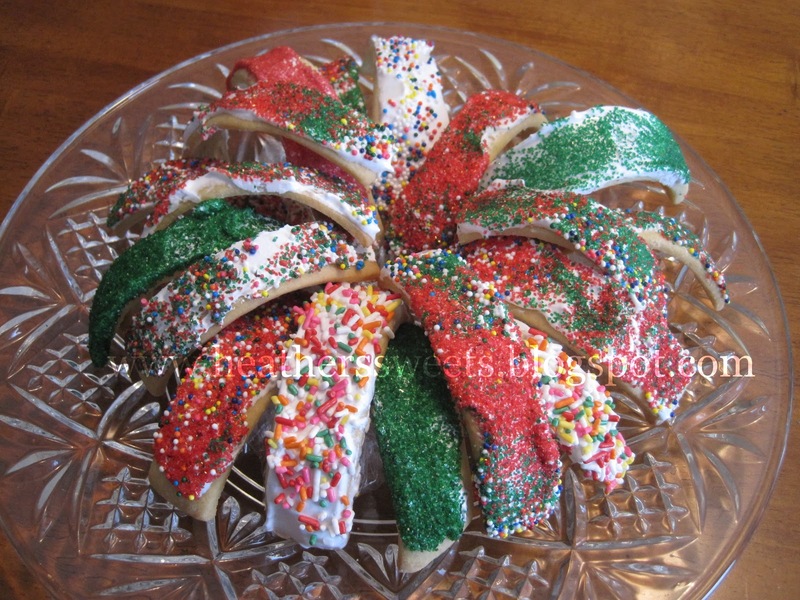 Every year around Christmas time, my aunt makes these mythical cookies that she calls Horse Collar Cookies. 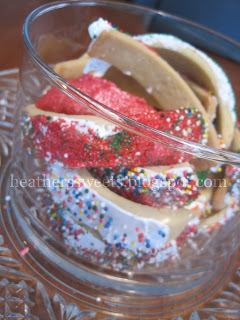 I call them mythical because my google-fu is defeated any time I have tried to look these cookies up. Every search term I try yields random, unrelated content that is most definitely not descriptive of the cookies and is often not in English. 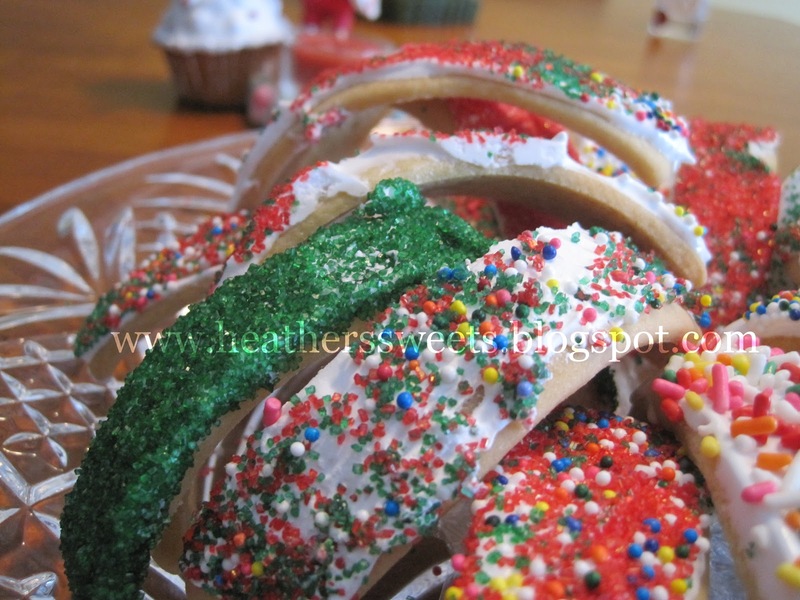 The cookies are basically a sugar cookie dough that is rolled out to about 1/8" thick and cut into 1" by 5" long strips and draped over a special domed cookie form and then baked. Once the edges are a little golden, they are removed from the oven and immediately removed from the form and placed on their sides to cool. The cookies are very fragile and your kitchen helpers may need to help get rid of evidence of broken cookies. These are frosted with Seven Minute Frosting and then promptly sprinkled (or dipped in our case) with sugars and decorations. They do not stand up very well so we laid them on their sides for the most part. Also, I was knuckle-deep in frosting so there are no pictures of this process. I also did not take pictures of the form they were baked on - it was a basically an upside down U shaped pan, probably about 12" long. I don't know what to call the pan or if it is available in the English-speaking world. There used to be a store called Maid of Scandinavia that sold them, but the store has been closed for a few years. The only local cake & candy store I know of does not seem to have anything that even vaguely resembles the form. In case you are of Scandinavian heritage and have some of these forms sitting around and no recipe, or you just want to try a different recipe and be a rebel and make them flat, I'll share the recipe my aunt was kind enough to pass on. Cream butter and lard, then add sugar, continue creaming. Mix in well beaten eggs, milk, and almond flavor. Sift together flour, soda, cream of tartar and salt. Add flour mixture to creamed mixture and mix well. On a lightly floured board, roll out to 1/8" thickness. 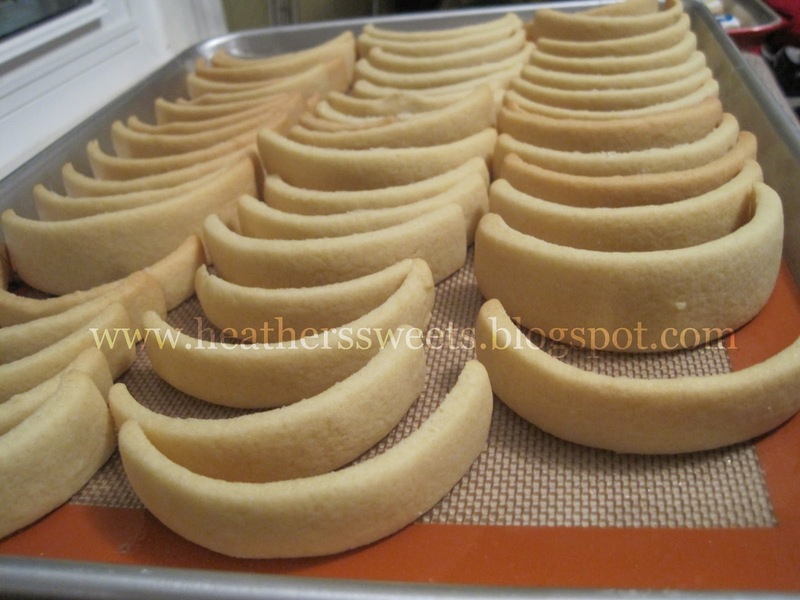 Cut the dough into strips 1" wide and 5-6" long. Drape the strips over the ungreased wafer form and place the form on a cookie sheet. Bake until lightly browned, about 5 - 7 minutes. Remove strips from form immediately and set them on their sides to cool. 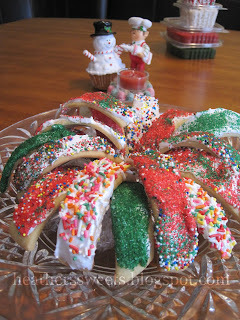 If cookies stick, spray pan with Pam between batches, wipe off with paper towels/remove crumbs. 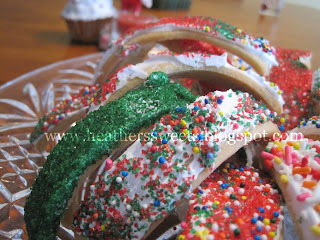 Frost with Seven Minute Frosting and sprinkle with sugars. Beat in double boiler with mixer on high speed for 7 minutes (until fluffy). I found them on the Internet. The post said: The mysterious cookie with many names: Kro Kaner, krokta, bridge cookies, spån, sponer, saddle cookies, wafer cookies, rock-a-bye’s, Santa Lucia cookies, bracelet cookies, or even horse collar cookies.